Today, we be introducing UBA Africard a Visa Prepaid card, for easy shopping online from Nigeria. The card promises to deliver across most online stores at a standard exchange rate for the dollar. You can acquire the UBA Visa Prepaid card (Africard) within a maximum of 1 hour from any UBA branch provided you have all the necessary details at hand. The benefits of this card is that you don’t need a bank account to obtain this card. An identification document (driving license/national ID card/international passport). Go with the bank with at least N2,000. Provided will all the requirements stated above, walk in to any UBA closest to you, go to the customer unit and request for the UBA Africard (Visa Prepaid card) application form. After a successful completion of the registration, your UBA card is ready after an hour. You can proceed to Pay at least N2,000 into the card with a 10 digit code inscribed at the back of the card. NB: You will get the card the same day provided you didn’t opt in for the personalized version that has your name inscribed on it. Normally Personalized cards take at least four days before you can get your card. After payment an envelope that contains your card and the activation pin and procedure to use your card will be issued to you. The 10 digit number inscribed at the back of your card is the account number you will be using to reload your card from any UBA branch. You will also be given 2 pins, one will be for withdrawal at ATMs and POS/Web purchases while the second one will be used to access account via the internet. 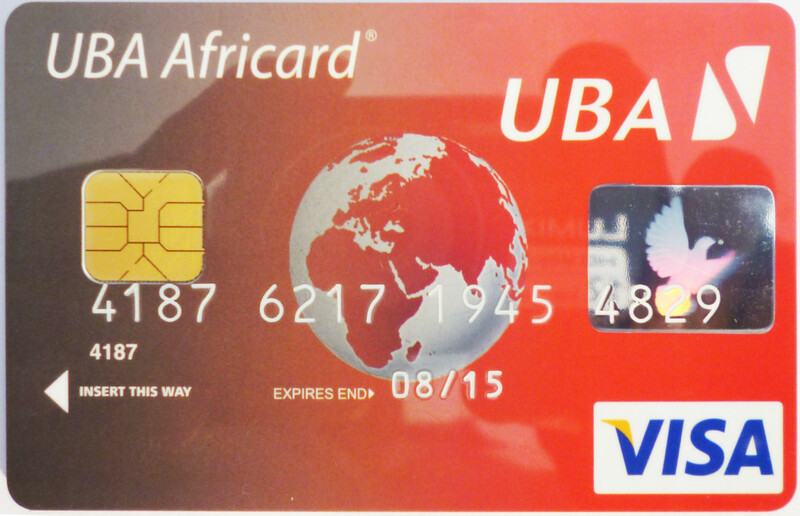 UBA Visa Prepaid card (Africard) issuance fee is N1575. You will also be charge N105 every time you recharge your card. Go to http://www.myubaafricard.com/ to access your account via the internet (balance enquiry, transaction history and card-to-card transfers). 4714221793567778 can you tell me . Who is the owner name , how much money are loaded in the card? My first experience with UBA VISA Pre-paid card has been an absolute nightmare. It is over a week I got the card and I have not succeeded in carrying out a single transaction. And the account is sufficiently furnished to cover my operations. Each time I try, my creditors tell me “Your card provider has refused to pay”. VERIFIED BY VISA confirms having treated the transaction as per activity statatement. Furthermore no error reported. So how frustrating this can be as time is of the essence. How can I call this good? Absolute trash! I JUST RECEIVED MY NEW UBA AFRICARD like the one above. How do I go to activate it? It is the weekend and I wont have contact with the person who sent it to me until Monday. I was hoping to be able to use before then. I have the 10 digits embossed on the lower left hand corner on the back. The front has no name. you need to visit the bank and request them to activate the card for online transactions. Hello, how much does it cost to activate a card with a cash of $ 2 million?